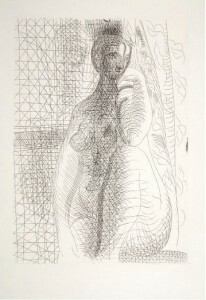 Picasso’s “Femme nue a la Jambe Pliee” is an original print. You may know a print as being a duplicated copy of a work of art. So, you may be wondering, “How can a duplicate be original?” There are many different types of prints, and not all of them are manufactured copies. You may remember the controversy last winter over Picasso’s original 1962 linocut print “Tête de Faune”. The popular card game company that makes Cards Against Humanity purchased the original print and put it up to their followers to vote on whether to donate it to the Art Institute of Chicago or cut it into 150,000 pieces (see the results here). Some argued that, since it’s just one in 50 of the same identical prints, that cutting it up would not be a huge loss. Others argued that, since it was an original work, it should be preserved. While the print was one of 50 identical prints made by Picasso, it was, in fact, an original, hand-made work of art. The difference between an original print and a manufactured one is in the process of production. While you may be able to order a print of your favorite work online that is made by a machine, purchasing an original print is much different. There’s a reason that original prints tend to be priced so much higher. It’s because these prints are painstakingly handmade by the artist or by a master printer after the artist has inspected the first few test proofs for quality. When designing the work to be printed, the artist designs his work to be made in a particular medium. So, for example, Picasso’s “Femme nue a la Jambe Pliee” was designed to be an etching. A print is made by pressing a plate, block, stone, or stencil to paper. The resulting image is mirror to the original one, which means that the artist must create the original image backwards. The artist creates a set number of prints or as many prints as possible within his desired limit before the plates begin to wear from the printing process. These prints are numbered and signed by the artist. Alexandra Nechita’s “The Unicorn” is a signed, limited edition print. It’s important not to be confused between the terms “original print” and “limited edition print”. The number of original prints are limited because the artist only makes a set number or can only make so many before the plates begin to wear out. A limited edition print, however, can also be manufactured and can be made at much higher volumes. Unlike some original prints, these limited edition prints are not made directly by the artist. Fine art print. This is a print that was originally created as a painting and was then translated into a lithograph or serigraph. 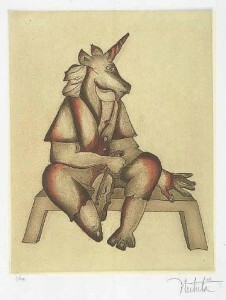 For example, Alexandra Nechita’s lithographs were created in the image of her existing paintings. These are usually small to medium edition. AP (Artist’s Proof). An artist’s proof is one of the first prints to be pulled off the plates. These prints usually comprise about 10 percent of the total number of prints and sell for about 10-30 percent higher than the regular edition. This is because these prints are a limited subset of the limited edition prints and are usually made by the artist. In fact, the manufacturer will sometimes give the artist’s prints to the artist for their own personal use, so these prints are harder to get ahold of and will sell for more than the regular edition. PP (Printer’s Proof). A printer’s proof is a small number of proofs that are given to the printer by the artist in appreciation. TP (Trial Proof). A trial proof is made before the production run. The purpose of these prints are to test the printing process and make sure the prints are being produced to the artist’s expectations. The number of trial prints can vary, as the artist may make changes before approving for production. HC (Hors de Commerce). “Hors de commerce” means “not for trade”. These proofs are made in very limited numbers, usually five to ten. They are meant for showing to gallery owners and art dealers. This entry was posted on Friday, June 24th, 2016	at 12:22 pm	and is filed under Print Mediums	. Both comments and pings are currently closed.